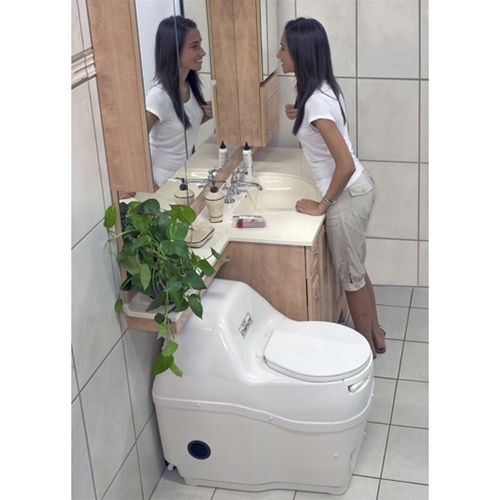 The COMPACT is a medium capacity electric self-contained toilet and an ideal model for light residential or light to medium cottage use. It is especially popular for use in cabanas, guest houses, pool houses, or any remote place where there is an electrical connection but no plumbing. 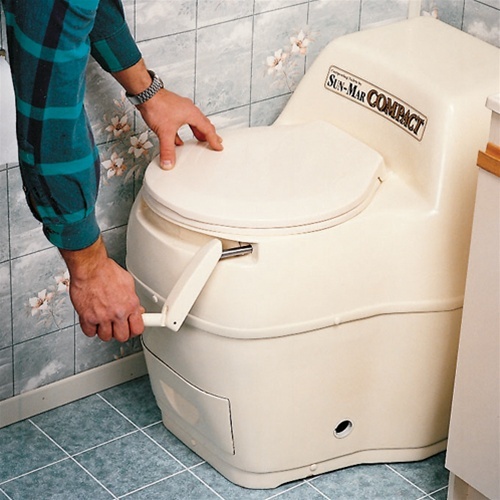 Because the COMPACT toilet uses no water, you won't have to worry about plumbing or hook ups for installation. All you have to do to install the unit is assemble the vent stack that comes included with the toilet. The COMPACT is designed as a small, low profile unit. 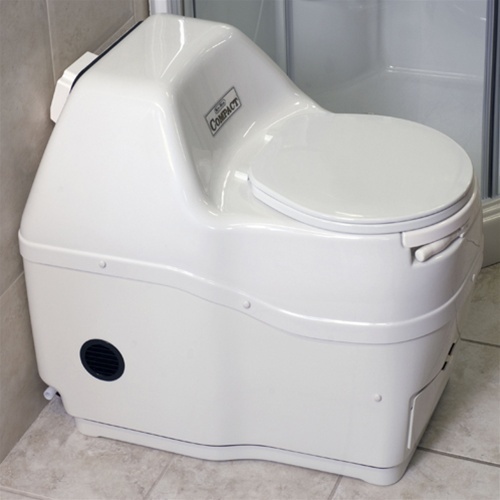 This allows the seat to be only slightly higher than a regular toilet, a feature that makes the COMPACT ideal for elderly or handicapped individuals. 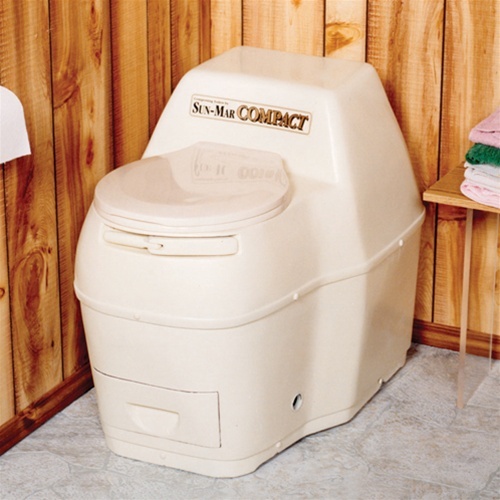 There is only one performance standard in North America for composting toilets, and that is the National Sanitation Foundations NSF/ANSI Standard #41-1999. 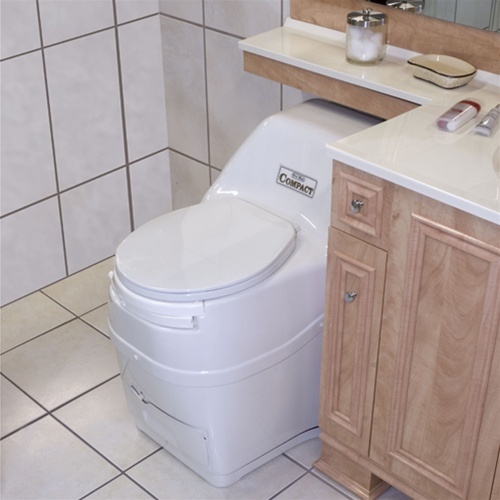 Only Sun-Mar composting toilets are certified by the NSF for residential and/or seasonal use. This means that all our composting toilets have been tested by an NSF recognized independent testing laboratory for 6 months at maximum capacity, and they are certified to operate without odor and produce a clean, safe compost. For verification, please see Sun-Mar's NSF Listing. 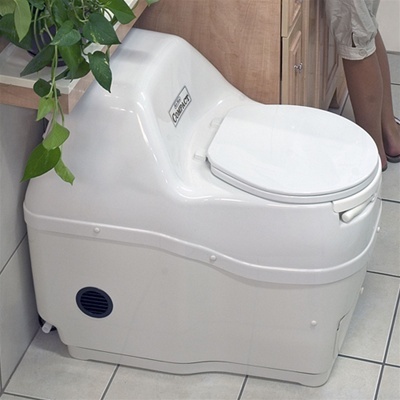 This toilet will compost any kind of toilet paper you like to use. At the time of initial start up, you will need to add some Compost Sure into the Bio-Drum™ together with some Microbe Mix. During continued use, add Compost Sure as specified in the product instruction manual. Rotate the drum 5 or 6 full revolutions, every 2-3 days. For weekend use, just rotate before you leave at the end of the weekend. You will need to move some of the compost to the finishing drawer, when the Bio-Drum™ is half to 2/3 full. This is accomplished by simply releasing the drum lock and rotating the drum backwards. 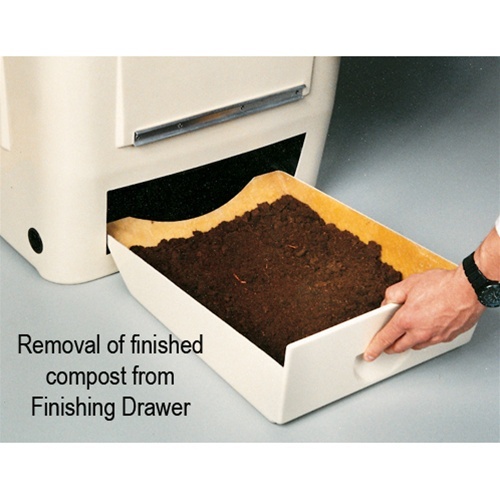 Finished compost then drops automatically into the finishing drawer. This process is quick and clean, as you never come into contact with fresh material. The compost should be left in the finishing drawer for at least 4 weeks so it can finish and sanitize. At this time, it is isolated from contamination by fresh material in the toilet. Once 4 weeks have passed, you can rthe finishing drawer at any time. Add the finished compost to your flower garden! The finished product is clean, dry, non-offensive, and sanitary. Electrical heater in the base of the unit warms and evaporates excess liquid. Odorless operation is maintainted by a fan assembly in the top rear of the unit that maintains a partial vacuum. 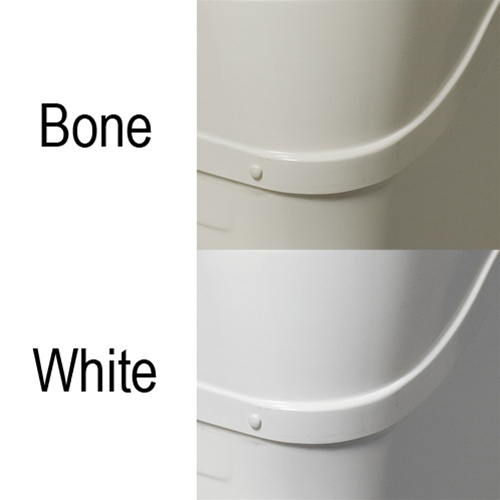 Available in your choice of Bone or White. Vent outlet center distance from left side (looking at back of unit): 7-1/2"
Height to center of vent: 23-1/2"